On Monday, I said goodbye to an old friend. I met this friend when I was ten, maybe twelve, sometime around then. This friend was with me through it all, through the good times and through the bad. We ate together, we laughed together, we chewed steak together. Alas, this relationship wasn’t meant to last, and on Monday it ended. It was one of my very favorite teeth, one way in the back, one that I used often. There was no tooth better. But on Monday it was unceremoniously yanked from the back of my mouth and I barely had time to say goodbye. That’s why I didn’t write on Monday. But today is Wednesday and I’m over that weak tooth. Today is about Loramoor, and about decisions, both good and bad. Like all that candy I ate when I was a kid, and the dentist who decided to drill out every last bit of that poor, deceased tooth. Today is about the decision to buy a tear down and build yourself a brand spanking new lake house. What a wonderful thing, this new house. It’ll be large enough and fancy enough; it’ll be perfect. You’re not one to live in someone else’s house, you’re the sort that wants your own house, with your own stamp of style and taste. I cannot blame you, as I, too, have built new homes and enjoy nearly everything about living in a new house. Over recent years, this building boom has touched every bit of our vacation home market. The tear downs that make the most sense are on the lakefront, of course, where properties can be bought with regularity for land value. New construction on the lake makes sense most of the time, but for every two tear downs that make sense there is one that doesn’t. Tear down a house on 100′ of frontage and build new for $2MM or so? Usually a great idea, depending on the location of those 100 feet. Pay $1.5MM for a house on 50′ of frontage and tear that down? Not usually all that smart. Off water, the same sorts of mistakes are made. Buy a cottage in Knollwood up the road from the lake for $300k and tear it down? Terrible idea, unless you’re looking to stay put for most of eternity. But the segment that is most interesting when it relates to tear downs is the mid-market of lake access homes with boat slips. It’s not uncommon for a buyer to pay $400-600k for a house in a neighborhood like the Lake Geneva Club, or Hunt Club Lane, or Glenwood Springs, and then tear the house down. In fact, it happens with some frequency. A home on Hunt Club Lane sold in 2013 for $659k. It was a unique house, odd really, with an acre and a half of land and a boat slip. The lot was not especially close to the lake. That buyer tore the house down and built new, effectively paying $659k plus demolition cost for a vacant lot. This is one example of a phenomenon that occurs all over this lake, and it’s occurring more and more now that the market is high on buyers and low on inventory. Even the homes that aren’t entirely razed are generally the recipient of some form of major renovation. That’s why the new listing I have in Loramoor makes complete and utter sense. My newest listing is a level vacant lot measuring just under one acre in size, with a transferable boat slip in East Loramoor, a slight lake view, and a location on Loramoor’s dead end lane. As opposed to the Hunt Club property that was far from the water, this lot is one off the lake (see map above). The asking price is $750k, no demolition required. 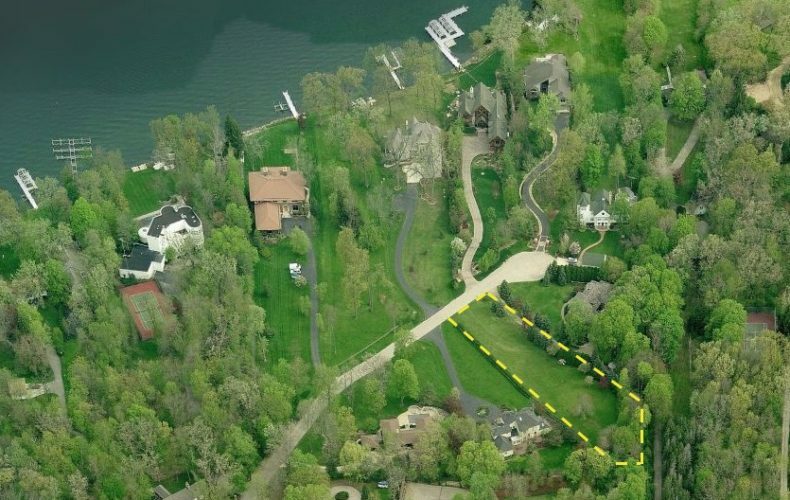 On the lakefront in Loramoor, I sold a beautiful lot last fall for $2.075MM. That lot will host an incredible new home this summer. Three doors to the West of my new listing is the old Loramoor stable house. This house was in poor condition for years until an enterprising buyer purchased it and fixed it up. That home is now for sale in the mid $1MMs. I sold the house at W3036 South Lakeshore last fall for $1.625MM, that with a slip in Loramoor, three acres and a pool. The market context for this Loramoor listing is complete and it’s thorough and it proves that high valuations can and do exist here. You could purchase a home in Shore Haven for $500k and tear it down. You could. People have. But what you’d be doing is building new in a neighborhood that has a cap of around $850k. The same is true for the Hunt Club example. It’s rare to have a lake access neighborhood support built value to the mid and upper $1s, but that’s exactly what Loramoor offers. Consider this lot. Consider a new home, built near the water with a slip and a swimming pool and a most exclusive address. It makes solid market sense, and it’s available today.